Working Preacher commentary, Luther Seminary, 2019. Faith in Process, Robert Gnuse, 2019. Exegesis and Sermon Notes, Stan Duncan, If You Lived Here You'd Be Home By Now, 2016. "Power of the Word," Sermon Seeds, etc, Kathryn M. Matthews, 2019. Starters for Sunday. Thoughts on Readings, Prayers & Hymn Suggestions. Office for Worship, Doctrine and Artistic Matters, Church of Scotland, 2019. "A Rough and Tumble Reception," D Mark Davis, raw translation and exegesis/questions, Left Behind and Loving It, 2013. The Lectionary Lab, Epiphany 4, the Rev'ds Dr. John Fairless and Delmer Chilton (aka "Two Bubbas and a Bible"), 2013. Lectionary Lab Live podcast. Girardian Reflections on the Lectionary, Epiphany 4C, by Paul Nuechterlein & Friends. Rumors, for January 31, 2010, Ralph Milton, "Sermon helps for preachers with a sense of humor." Living by the Word, Cleophus LaRue, The Christian Century, 2019. "Rejected," Glenn Monson, Law and Gospel Everywhere, 2019. "Moving beyond Mending our Walls," David Lose, ...in the Meantime, 2016. "Love Never Ends," Karoline Lewis, Dear Working Preacher, 2016. "Get Your Prophet On!" discussion and commentary, RevGalBlogPals, 2016. 11th Hour Preacher Party. "The Gift of Rejection," David F. Sellery, 2016. "Blessing That Meets You in Love," Jan Richardson, The Painted Prayerbook, 2016. "Good News for the Outsider: How Might This Change Us?" Janet H. Hunt, Dancing with the Word, 2016. "Home Town Visit Goes Awry," Bob Cornwall,Ponderings on a Faith Journey, 2016. "For the Love of Stewardship," Sharron R. Blezard, Stewardship of Life, 2016. "Biblical Marginalia," Dan Clendenin, Journey with Jesus, 2016. "Prophets and Hometowns," Eric Smith, LECTiO, 2016. "The Unwelcome Word," Jana Bennett, Ekklesia Project, 2016. "The Politics of Cruciform Love," Political Theology Today, 2016. "Words of Our Mouths," Lynn Miller, celebrating our creative and living God by generating art and architecture resources for congregations and individuals. Art and Faith Matters facebook page contains additional resources. "Justice, Mercy, Love," Sermon-Stories, 2016. "Spreading Word," Thomas Beam, 2016. "Escaping from the Boxes," Andrew King, a poetic kind of place, 2016. "How to Tell The Difference," Scott Barton, lectionary poetry, 2016. "Three Questions and a Promise," David Lose, WorkingPreacher, 2013. "God's Odd Choices," John C. Holbert, Opening the Old Testament, 2013. "Putting Words in Your Mouth,," Sharron R. Blezard, Stewardship of Life, 2013. "'From a White Colonitst to a Black Councilman," Epiphany 4C, The Journey with Jesus: Notes to Myself, Daniel B. Clendenin, Journey with Jesus Foundation, 2013. 2010. 2007. "Whom do you assume that I am?" Lectionary Reflection, bethscib, 2013. "The Mount of Jumpification," Alyce M McKenzie, Edgy Exegesis, 2013. "Oh Boy Jeremiah," Michael Coffey, 2013. "The Aerial View," Melissa Bane Sevier, Contemplative Viewfinder, 2013. "'The Old Home Town Acts the Same...'" Peter Woods, I Am Listening..., 2013. "Rejoice in the Truth," Janice Love, The Ekklesia Project, 2013. "Alexander the (Passionate) Corrector," Neil Chappell, A Weird Thing, 2013. "When Do Prophecies Cease?" Steve Godfrey, Church in the World, 2013. Jesus: A Spiritual Man Confronts Religious People, Richard Mario Procida, Modern Lectionaries, 2013. "Only," the Rev. Dr. Janet H. Hunt, Dancing with the Word, 2013. "Love and Virtue," Mark Ryan, The Ekklesia Project, 2010. "Have You 'Herd'?" Peter Woods, I Am Listening, 2010. "If Jesus Was Your Preacher," Nadia Bolz Webber, Sarcastic Lutheran, 2016. "Sometimes Love Looks Like This," by Michael Renninger. A Sermon for Every Sunday: video sermons for every Sunday of the liturgical year. "You're Nothing Without It," the Rev. Michael Bos, Day 1, 2013. "Love Is for Grownups," the Very Rev. Robert Wright, Day 1, 2010. "Growing Pains," the Rev. Francis Miller, Day 1, 2001. 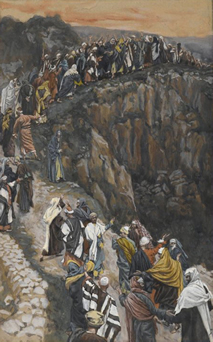 "Prophet on the Edge," Weekly Seeds, UCC, 2019. Mustard Seeds, "Ministers of God," Epiphany 4C, 2019. A lectionary-based ideas resource for leaders of contemporary worship, Ann Scull, Gippsland, Australia. Worship Resources, Epiphany 4, Rev. Mindi, Rev-o-lution, 2016. Lectionary Liturgies, Epiphany 4C, 2019, Thom M. Shuman, Presbyterian Church (U.S.A.). Worship and Liturgy Resources, Epiphany 4, by Rev David Beswick, Uniting Church in Australia. Lector's Notes, Ordinary 4C, Gregory Warnusz, Saint Jerome Parish, Bellefontaine Neighbors, MO. Notes and commentary for those reading this week's lectionary texts to the congregation. "Liturgy: prayers reflection," reflections on the collect at the Eucharist, NZPB. Rev. Bosco Peters, New Zealand. "Service Prayers for Epiphany 4," Worship Ways, UCC. HermanoLeón Clipart, Sunday 4C. Free clipart, backgrounds, slides, etc. Clip Art, Epiphany 4C, Fr. Richard Lonsdale, Resources for Catholic Educators. Clip Art Images: Luke 4:21-30, Luke 4:21-30 #2, Misioneros Del Sagrado Corazón en el Perú. Valentine's Day Item, John Stevens, Dollar Store Children's Sermons, 2016. "They Raged At Jesus' Sermon," a hymn by Carolyn Winfrey Gillette, based on the story of Jesus' rejection in his hometown of Nazareth and a call to follow his inclusive love. Tune: LLANGLOFFAN 7.6.7.6 D ("Rejoice, Rejoice, Believers") and WEBB ("Stand Up, Stand Up For Jesus"). "God Bless the Poet's Heart and Hand," Carolyn Winfrey Gillette. Original hymn to the tune TALLIS CANON. Original Hymn by Carolyn Winfrey Gillette (Race Relations Sunday): God, With Joy We Look Around Us Tune: REGENT SQUARE "Angels, from the Realms of Glory"
"Stop the Clanging," Brenton Prigge, REGENT SQUARE, NewHymn, 2007. Hymns of the Spirit Three, Epiphany 4C, Richard E. Hurst, Universalist National Memorial Church. Hymn and Song Suggestions, Epiphany 4, 2019, annotated suggestions from Natalie Sims, Singing from the Lectionary. Worship Resource Manual, The Moravian Church, Southern Province. Worksheets for planning music in worship: hymns, anthems, solos, organ repertoire suggestions for RCL texts. Direct link to Epiphany 4. Choral Anthem Project, Ordinary 4C, National Association of Pastoral Musicians. Lectionary Hymns, Ordinary 4C, National Association of Pastoral Musicians. Worshiping with Children, Epiphany 4C, Including children in the congregation's worship, using the Revised Common Lectionary, Carolyn C. Brown, 2016. "Like Meat Loves Salt," On the Chancel Steps, children's resources by Frances Woodruff, 2013. "The Greatest of These Is Love," Dianne Deming, Children's Sermons Today, 2013. "Cookie Cutter," video, John Stevens, Dollar Store Children's Sermons, 2013. Story for Children's Worship and Family Activity, Ordinary 4C, at word-sunday.com: A Catholic Resource for the Lectionary by Larry Broding.